When it comes to ukiyo-e artists there aren’t many names as legendary as Utagawa Hiroshige. Born in 1797, the iconic woodblock print master rose to prominence thanks to his stunningly intricate landscape paintings. Over his career he crafted a number of monumental series, but perhaps Hiroshige is most famous for The Fifty-Three Stations of the Tokaido produced in 1833–1834. In this series, he documents the journey along the Tokaido. The Tokaido, or Eastern Sea Road, was once the arterial highway of Japan connected the Shogun’s seat of power in Edo (current day Tokyo) with the imperial capital of Kyoto. The unforgettable imagery of this series cemented the artist's reputation as not only one of Japan’s best artists, but also one of the nation’s most significant historical documenters. 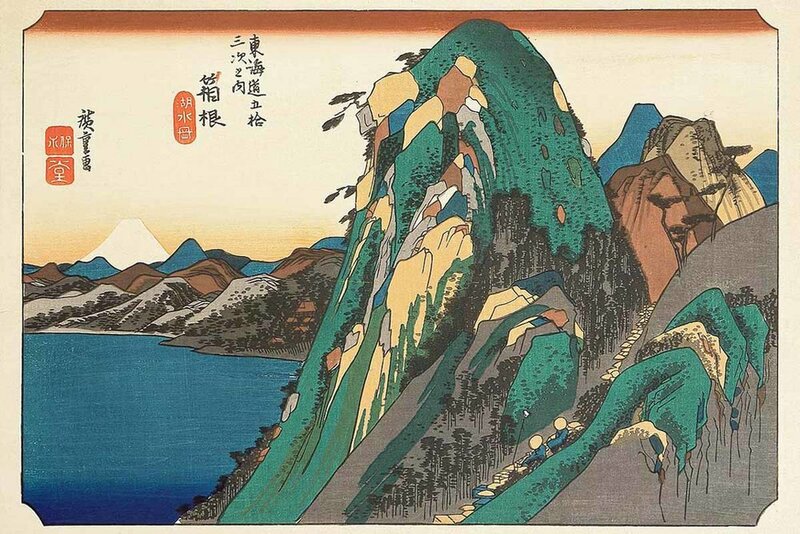 Here’s a closer look at a selection of ten of Hiroshige’s incredible woodblock prints. This print marks the starting point of the Tokaido route from Nihonbashi (Japan Bridge) in Edo. On close inspection you can see a diverse range of characters making up the scene. There are daimyos (feudal lords), flower sellers, young Buddhist disciples and an array of animals in a lively display. The colors of the sky here are a simple and effective way to indicate an early sunrise scene at the start of the journey. The town that makes up the 7th station is Hiratsuka, is a stunning, yet often overlooked Japanese city located just over an hour from Tokyo and Yokohama, near the Pacific Ocean. In background you can see Mount Fuji peaking from behind the foothills. Today Hiratsuka is most famous for its summer Tanabata, a colorful August festival, and the biggest of its kind in the Kanto region. Mount Fuji is obviously a very compelling motif in Japanese art. Take a look at how some of Japan’s other famous artists have taken it on in Views of Mount Fuji. Hakone today is a day trip from Tokyo, but during the Edo period arriving here meant that you were a good way into your journey and already leaving the Kanto region. This print depicts the lush green mountainsides, jagged untamed cliff faces, overgrown wild flora and the iconic Mount Fuji sitting valiantly in the background, all of which you can still see today. Look closely and you’ll see this deeply detailed painting continues to follow the daimyo procession en-route to the next station. A mix of still landscape and character movement it’s an ideal harmony of Hiroshige’s woodblock print techniques. The 12th Station is the village of Numazu. Hiroshige’s print depicts three travelers making their journey along a bank, heading towards the village. One of the travellers appears to be carrying a large face on his back: an iconic Tengu mask. Tengu is a Japanese folk figure generally considered to be a Shinto god and is often seen in ukiyo-e prints. If you want to learn more about Japanese art, check out our Ultimate Guide! Known as Deep Snow at Kambara, this image may be vaguely familiar to some 90s music fans as it was used as the cover artwork for US indie rock band Weezer’s 1996 album Pinkerton. In this image we see the small mountain village and its people loaded down under the weight of the pure white snow. Kanbara is a small village in Gunma Prefecture. 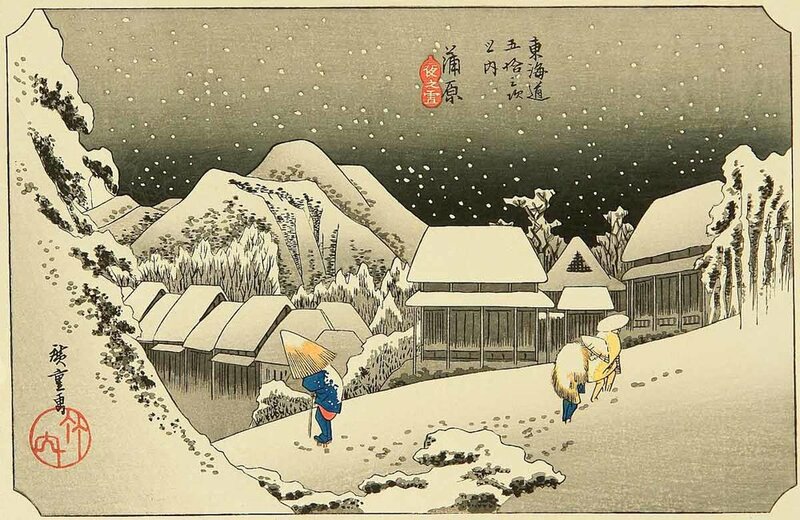 This print is one of only two in the series that shows the winter snow, and in fact it is assumed to be imagined, as it does not often snow in this corner of Gunma. Perhaps Hiroshige was doing his best to include a full complement of seasons in this collection. The 17th station of the Tokaido is at Okitsu, a city in Shizuoka Prefecture. Here we see a cluster of weary porters trying to make their way across the Okitsu River, while carrying two sumo wrestlers, definitely not the easiest cargo to transport. Although it’s shallow, the river is wide, which makes it rather challenging to cross. The expressions on the travellers and the horse clearly display the trying nature of this long and arduous road. Fuchu, the capital city of Suruga, is today part of Shizuoka Prefecture. Once though it was well known as the post-retirement home of Tokugawa Ieyasu (1543-1616), founder of the Tokugawa Shogunate and one of Japan’s most powerful and famous political figures. In this vivid image we see three ladies being carried across the river by porters. With its deep natural colors and balanced landscape it’s clear in this piece how Hiroshige’s art influenced the work of French Impressionists like Monet and van Gogh. The 31st station in the series, this painting Arai is a little less landscape-focused and a lot more about the action. Earlier in his career Hiroshige had focused mainly on beautiful women and famous actors as his subjects, motifs generally considered to be more typical ukiyo-e themes. You can see his knowledge and experience recreating the human form in this piece, with so much action and movement injected into these two simple standing figures. When it comes to the use of color, this is one of the more cooler pieces temperature-wise. In this picture we see a procession of daimyo and retainers, marching past the stations of Shirasuka, on the coast of Shizuoka Prefecture. In this print Hiroshige has managed to create an intriguing sense of movement while only revealing glimpses of the moving parts. The Sanjo Ohashi marked the end of the journey along the Tokaido and the arrival in the imperial capital of Kyoto. In this final image, Hiroshige views the landscape from a much further distance than in previous pieces. This famous woodblock print is an excellent example of the artist’s masterful use of color. The hazy orange skyline which contrasts with the cold blue of the water frames the image, while still allowing your eye to be drawn to the more neutral browns of the painting’s focal point, the bridge. We also see simple color blocking fill in the residential landscape, making it a simple, but overall powerful image. These are just a handful of the iconic recreations of Japanese scenery, history and everyday life in Utagawa Hiroshige’s Fifty-Three Stations of the Tokaido. Which are your favorites of his works? Let us know in the comments below.